Coincidentally also on 7th April Postmaster General Reginald Bevins told the House of Commons that a number of actions were being planned by the Government against Radio Caroline, including if necessary jamming the station's signal. He also assured the House that advertisers had agreed to boycott Radio Caroline, that the respective record and music industry associations were co-operating with the Government in taking action against the station and also confirmed that Panama had withdrawn the radio ship's registration. 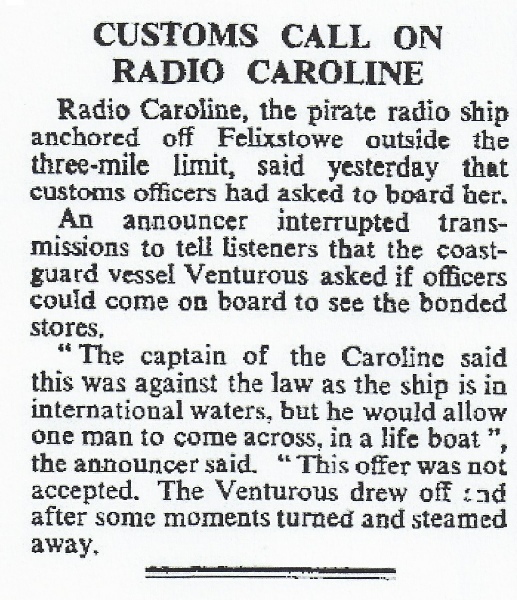 However, the nearest any official body came to attempting direct intervention in the early maritime operation of Radio Caroline occurred on 6th May 1964 when, the Royal Navy vessel HMS Venturous came alongside the MV Caroline and requested permission to board the ship to inspect her bonded stores. Permission was refused by the Captain of the Caroline on the basis that it was a foreign-registered ship anchored in international waters. As a gesture of goodwill he did offer to allow one man aboard, via a lifeboat, but this offer was refused by the Customs officials who had come out with the Royal Navy on board Venturous. Eventually the Venturous sailed away from the MV Caroline without having succeeded in putting a man on board the radio ship. Listeners to Radio Caroline were kept fully informed of this incident by DJ Simon Dee through live newsflashes interrupting normal programmes. This high profile publicity probably deterred the Navy and HM Customs from taking any action to board the Caroline by force. The Government preferred to await international action to outlaw offshore broadcasters as the Postmaster General informed the House of Commons on 2nd June 1964. Outside the Government various organisations and authorities also made threatening noises against Radio Caroline. In April 1964 Phonographic Performances Ltd. (who collected copyright fees for any public performances of their members' recorded works) threatened to issue a writ against Radio Caroline to prevent the station 'stealing' copyright material. Although nothing definite came of this threat, Radio Caroline (and some later stations) did offer to pay copyright fees, placing Phonographic Performances in a difficult position - on the one hand the organisation vociferously criticised offshore radio stations for not paying fees, but at the same time it did not want to be seen to accept any monies from what, in its opinion, amounted to illegal business activities. In another case of dual standards, major record companies adopted both a public and a private attitude to the offshore broadcasters. 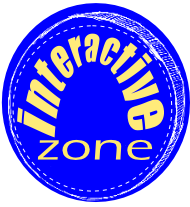 Publicly they refused to co-operate with the stations, but behind the scenes all companies or their representatives made great efforts to ensure that copies of the latest releases were made available unofficially for the offshore stations to play. Advertisers also were at first reluctant to buy airtime, preferring to wait and see what the station sounded like, the size of audience it attracted and more importantly, what, if any, official action would be taken against it or anyone who was seen to be supporting it commercially. During the early months of Radio Caroline's transmissions the station's programmes consisted of DJs announcements and, of course, music all day - which was the great novelty and attraction for listeners. 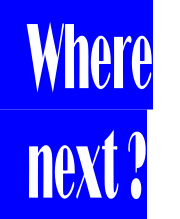 Many (but not all) of the early programmes were from the pre-recorded stock which had been made by Simon Dee, Chris Moore, John Junkin and Carl Conway in London studios while the station was still in the planning stage. Tapes were often broadcast more than once and after a few weeks on the air Simon Dee and Chris Moore resorted to editing the recordings by cutting and splicing tapes to vary the order of records! The programme content in those early days was a blend of pop music mixed with established 'middle of the road' material. But, even though many of the early programmes were pre-recorded and contained music which was not pop or chart material, audiences in their millions, young and old alike, loved the informality of the station and most of all the unique phenomenon of music broadcasts being available all day, every day. Unforeseen incidents affecting the ship and frequent comments about daily life onboard also captured listeners’ attention and helped create a ‘bond’ between the DJs and their audiences. 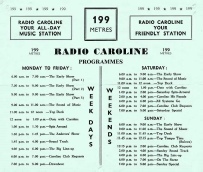 In response to g rowing audience demand Radio Caroline soon increased its airtime from the initial twelve hours a day and continued broadcasting until 10.00pm each night. This was subsequently modified to 8.00pm because of poor night time reception caused by interference from continental stations. 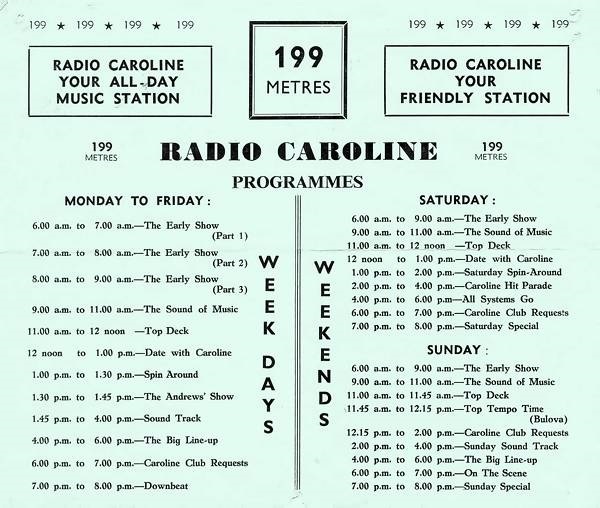 Later Radio Caroline started to reopen again on Saturday and Sunday mornings at five minutes past midnight (when the continental stations had closed) and stayed on the air until 3.00am with late night party music. An early example of Radio Caroline’s programming with Simon Dee (live) introducing Carl Conway (on tape) and interrupting with a station ID and time check. Note the varied mix of music played at that time - May 1964.